Click on the first thumbnail to see the gallery or scroll down to the larger single photos which have a more detailed account of the process. 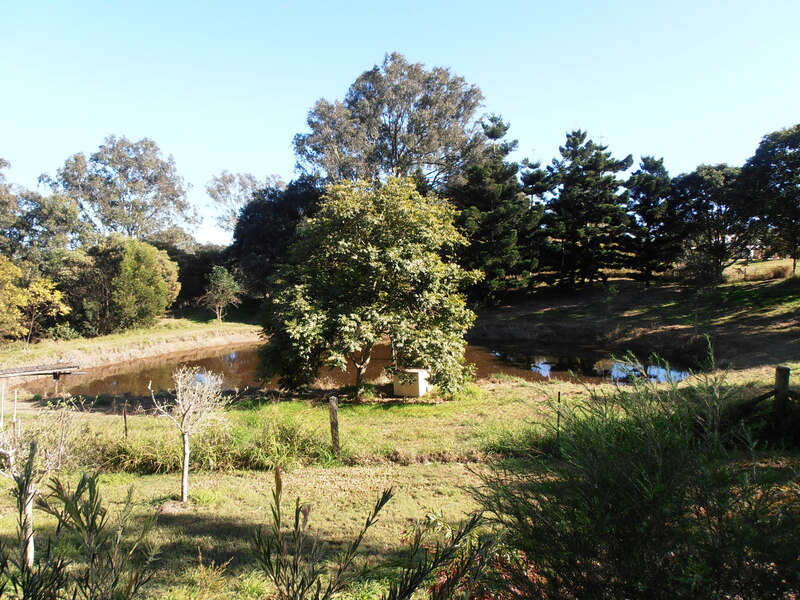 The original idea was to build a SMALL pond at the head of the gully to trap run-off and to provide a water source for the gardens. Ian had first looked at the idea of a bore (either with a pump or a windmill) as a source of water, but there was no guarantee that the water quality would be suitable because of the coal seams running underneath. 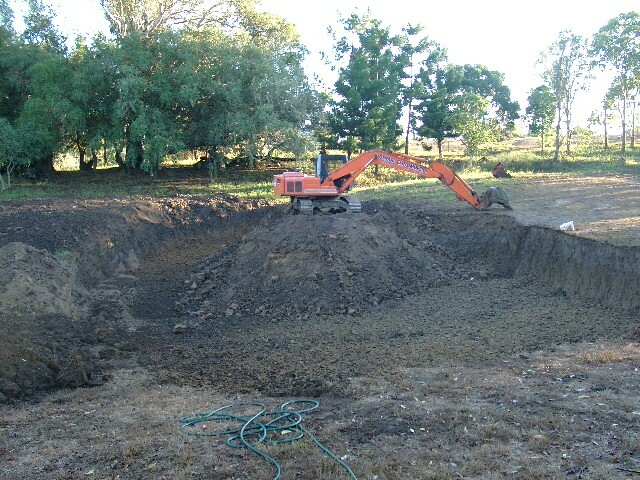 Once digging started, the soil was so friable that the contractors had to keep expanding and deepening the hole until they could get to an impermeable clay base. 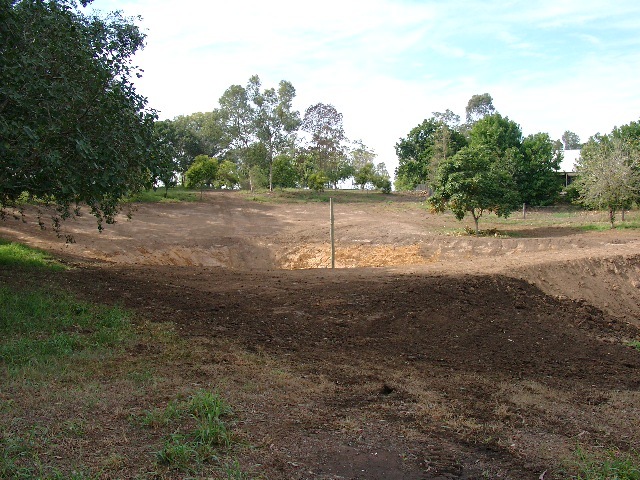 In the past the front paddock had been known to become covered in water. 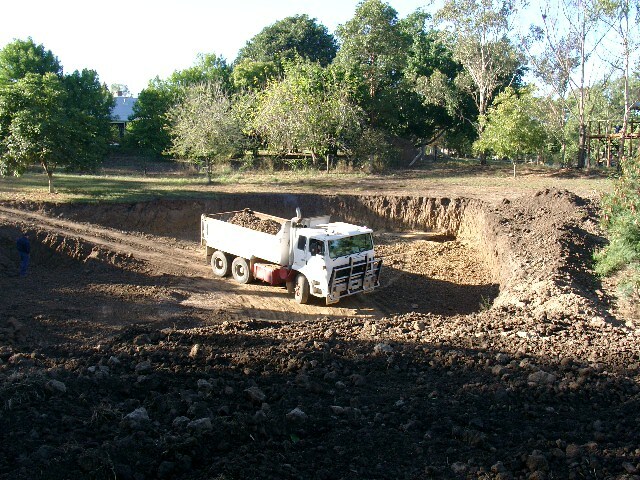 The Department of Main Roads had built new drainage ditches before we bought the property. Now, however, with all this extra height from the excavated soil being spread out, even in the wettest conditions the water only accumulates slightly in the bottom corner near the driveway. 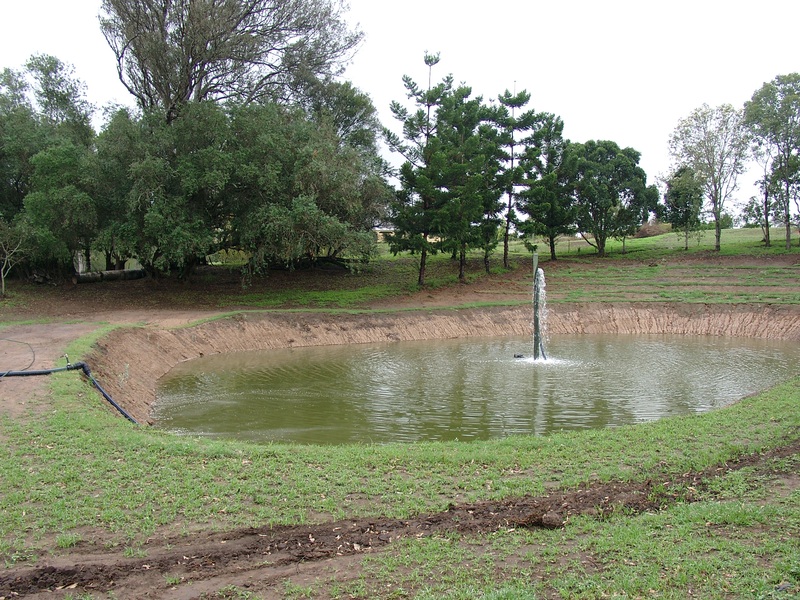 The dam was landscaped to manage run-off from above and next door. 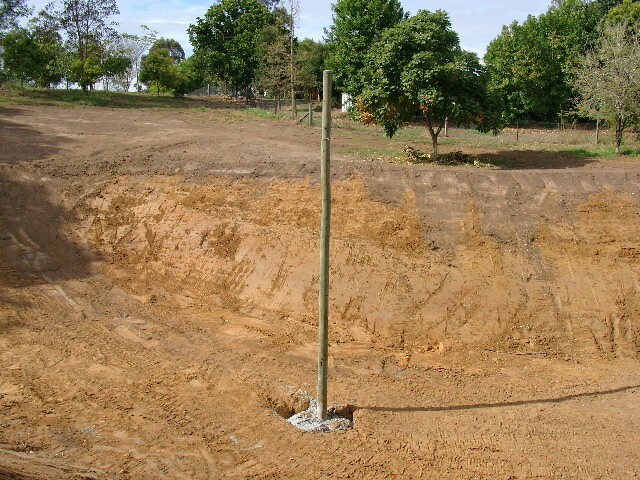 Then all the sides were smoothed and a pole concreted into the centre which would support the water pipe coming up from the river. Unfortunately this base was not able to hold the water and so the contractors had to return and reseal the sides of the dam with clay. 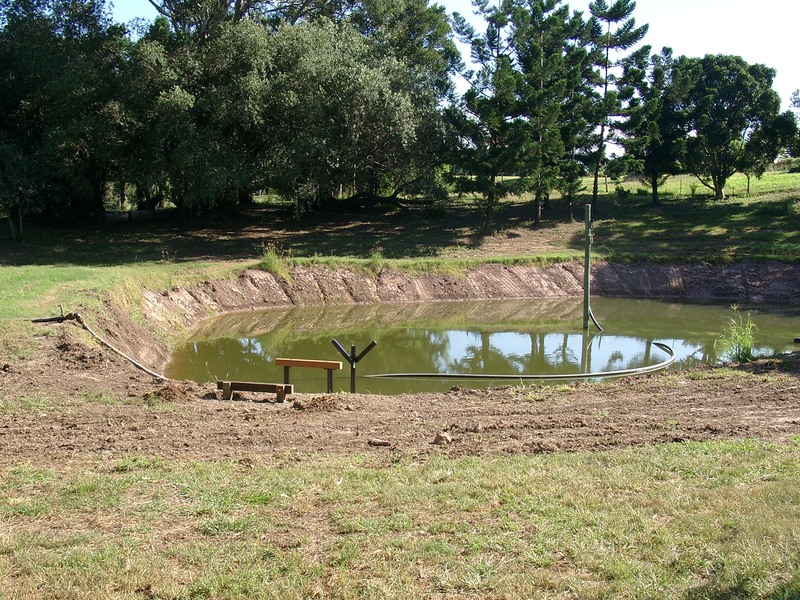 Also the pipe feeding into the dam was moved to the side so that the dam wall would not be weakened. The large pipe was designed to allow water to flow out if the dam was reaching its capacity. But after the dam had reached a certain height, once again the water leaked away – admittedly more slowly – through the clay seal. Ultimately the dam walls and sides had to be battered down with diatomaceous earth. 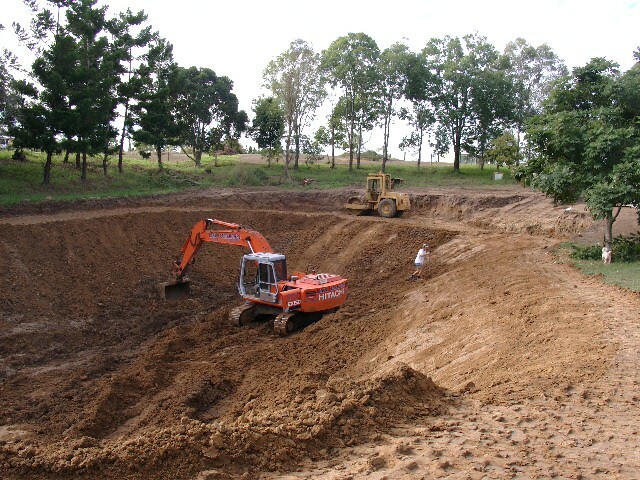 Now the dam was filled for the third time and this time it was filled to the top. After two electric pumps had failed, the flow of water was powered by a diesel pump down at the river (attached to the pontoon). We estimated that the dam held between 2 and 3 mega-litres. 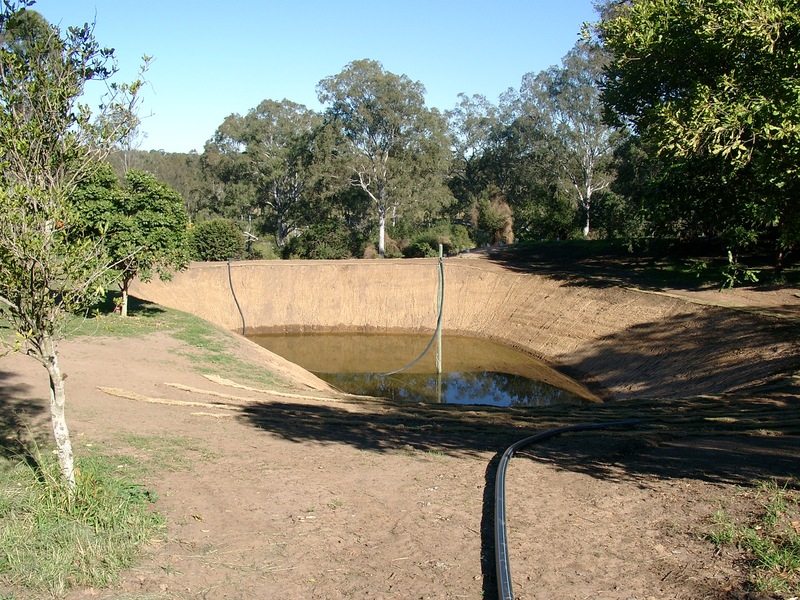 This pump in the foreground of the above photo was attached to a reticulation system of 1.5 km of pipes running to various gardens around the property. Below is a photo of a diving platform in the process of being constructed. After thinking that it would be fun to swim in the dam there has only ever been one occasion on which Ian plunged in from the diving board and swam across to the other side. It was FREEZING compared to the temperature in the swimming pool. The colour of the water has been the most significant deterrent – at times a thick sluggish green, or an opaque brown. Presently it has the colour of black tea! 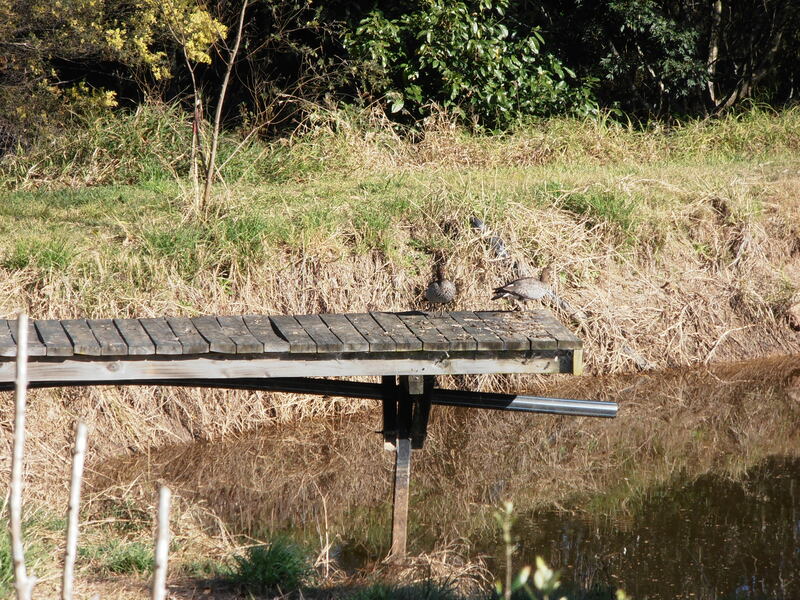 However the ducks have turned the dive board into their own personal viewing and preening platform. The dive board does serve another useful function. 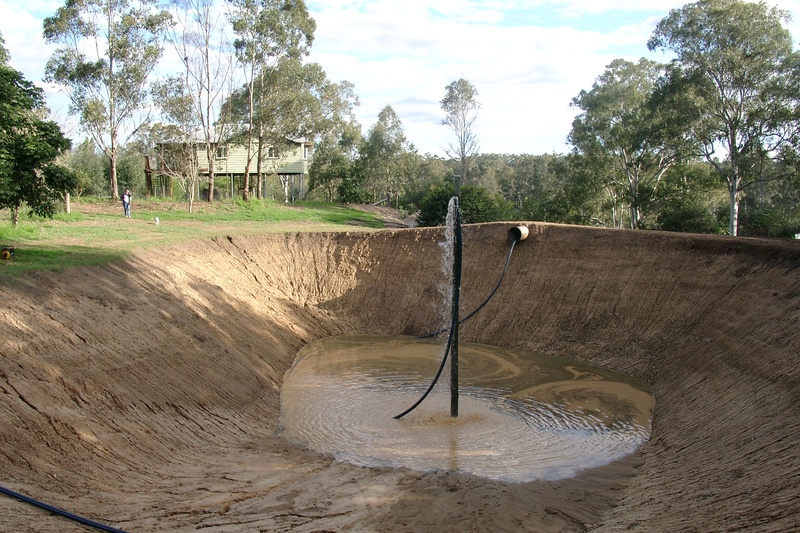 A pipe runs from the cottage gutter system so that any overflow from the water tanks is siphoned into the dam – the pipe outlet is supported underneath the platform. 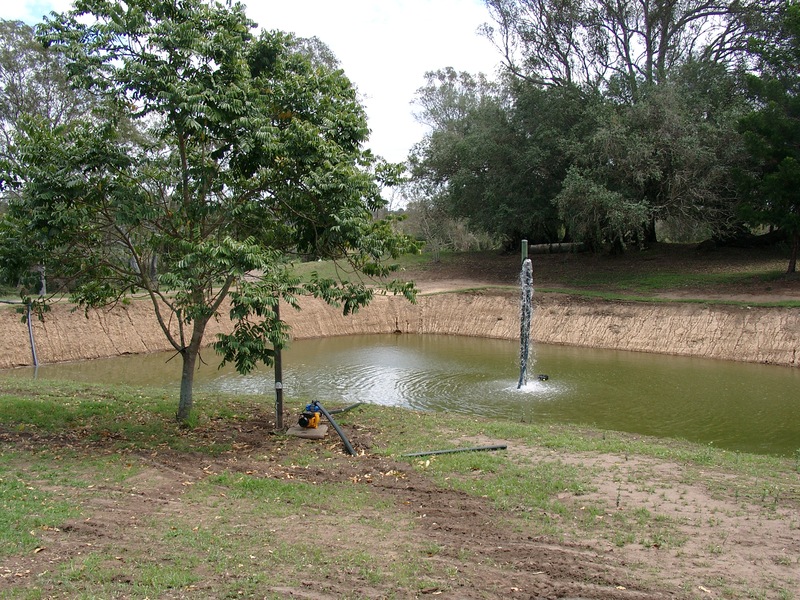 We purchased enough Couch turf to lay it in alternating strips all around the bowl that sloped down towards the dam. 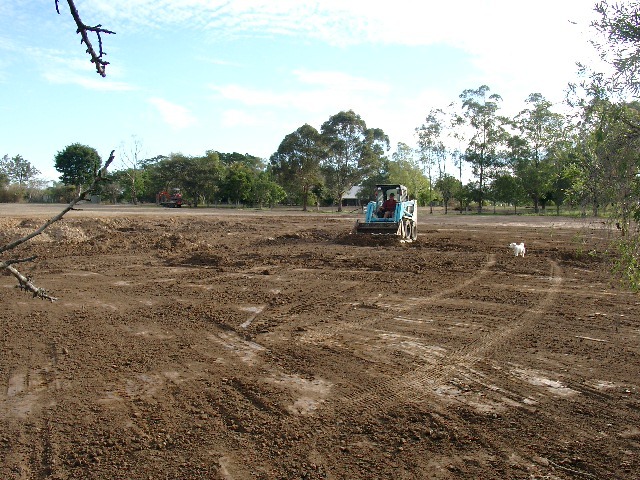 Gradually the grass covered over the remaining spaces. 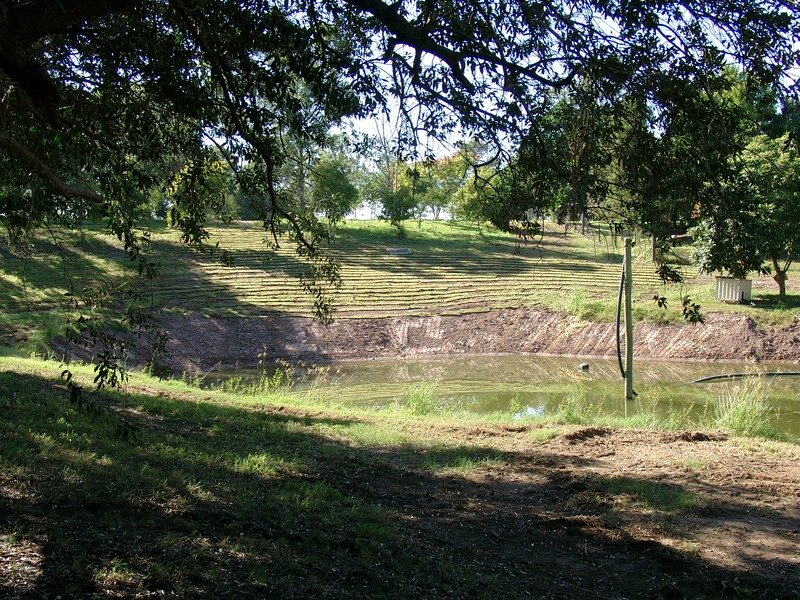 By mid-2006 the dam was fully operational and being used to water new plantings all around the property. 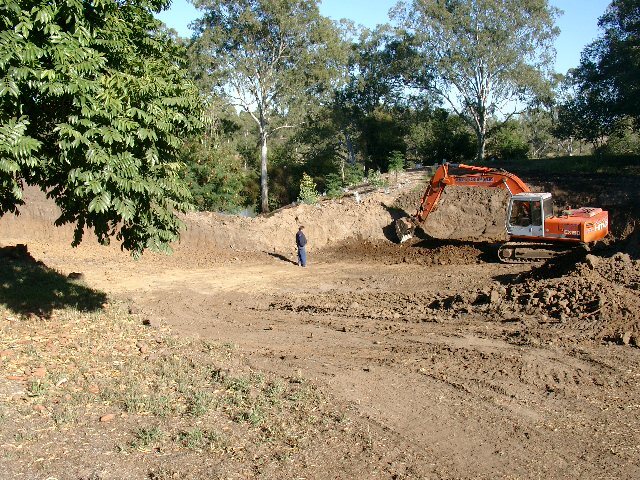 The dam was being re-filled with river water however at some point in late 2006 the percentage of salt in the river became too high for it to be used for watering plants – the Brisbane River is tidal and it had fallen to a low level, with mangroves extending into the Moggill reach due to lack of rainfall over a period of time. It was pointless pumping water up from the river. As the drought extended through 2007, 2008, 2009 and part of 2010 the dam gradually dried up as is evidenced by aerial photos of the property during this time and by this following photo taken on 25th January, 2007. 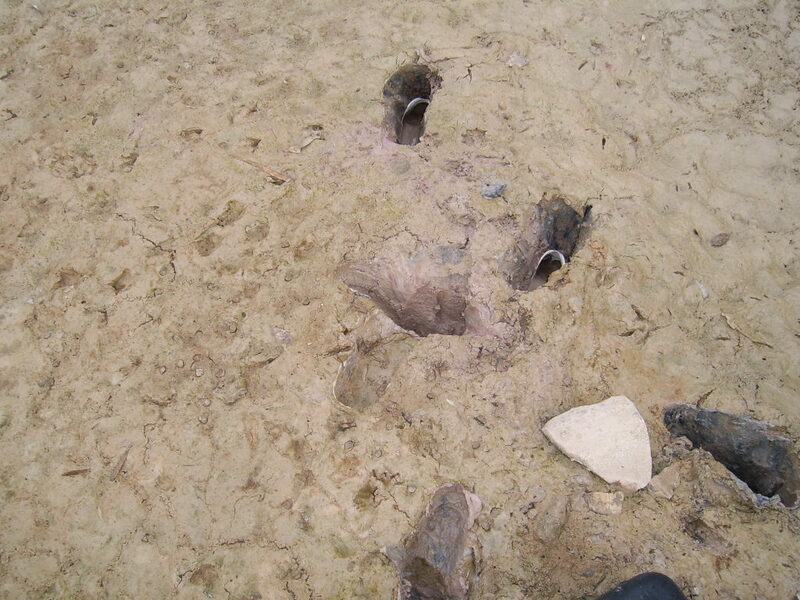 In an attempt to take close-up photos, Janet walked down into the dam and from now til the end of time there will be a pair of plastic shoes embedded in the base of the dam. Towards the end of 2009 there was some rainfall and by the end of 2010 the rainfall was such that the dam was full again. At Christmas 2010 Andrew gave us some native fish – 5 Silver Perch, a number of Fire-tailed Gudgeons and Freshwater Prawns (supposedly good for keeping down the algae and eating mosquitoes but unsure which exactly performs these tasks). 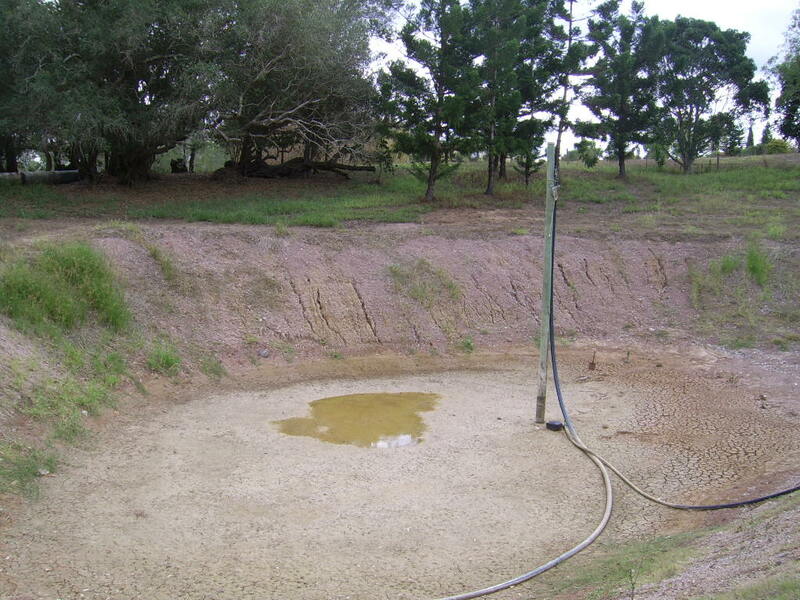 As the time ticked over into 2011 the amount of rainfall was starting to become alarming, the dam was releasing water through the overflow pipe and we were not sure whether the newly-purchased fish had not already floated out through the pipe. Then the flood occurred. At this point all the infrastructure for pumping water from the river up into the dam was swept away. So the only source of dam water from that time would be rain. 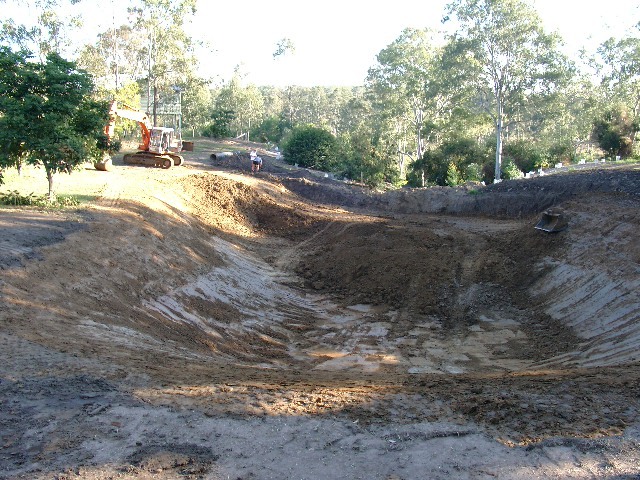 The dam played a big part in sustaining the 800 plants along the riverbank and groves between rain events from May 2011 til September 2011. 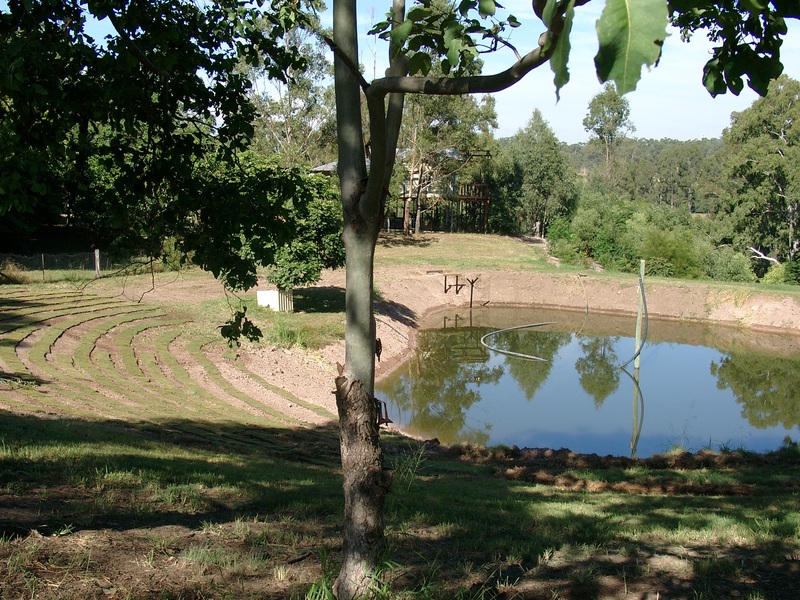 Since then the dam water has been used to sustain new plants on the northern slopes and scattered transplanting of dianellas and lomandras in other gardens. More recently we noticed movement in the dam and together we witnessed the neck of a turtle! Another guest was also on hand in 2012 to notice the turtle too – we had not been imagining things. How it came overland to the dam we do not know. The wildlife are quite at home using the dam facilities!